Winter has many of us inside a majority of the day. With those days being shorter; we tend to run out of things to keep away the winter blahs! We have enjoyed board games this winter, and were so excited about the Create Your Own Scrabble Board from Cafe Press to add to our fun. There are 12 different designs available to showcase some of your favorite memories and photos. Have an upcoming anniversary, birthday, graduation, or other celebration? This is the perfect gift for that! 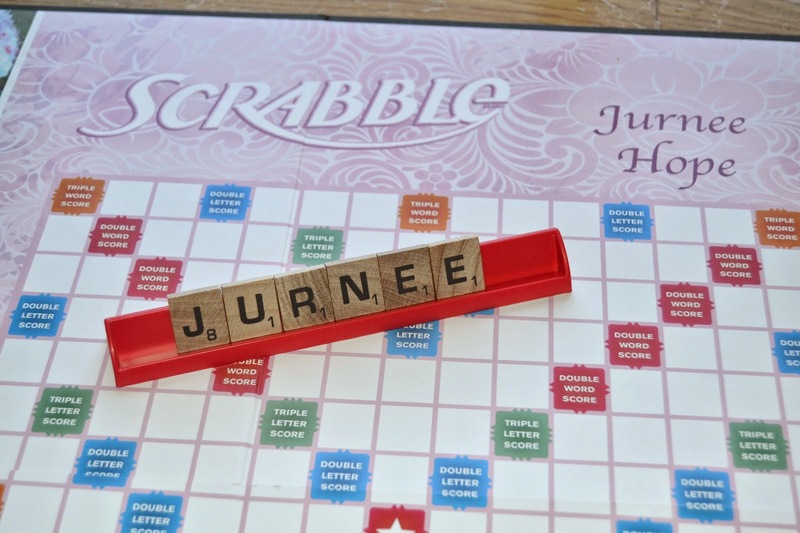 We decided to utilize our customizable scrabble board to celebrate our newest addition, Jurnee Hope! Not only have we enjoyed playing scrabble on the board, it will be a heirloom for her to enjoy for years to come. We used the Custom Love in Pink Scrabble board which would also work wonderfully for a wedding, anniversary and Valentine's Day. With room to add names and a special date, you can customize the board to your liking. Not computer savvy? Cafe Press has made it simple for you to upload your photos and add text, with easy to follow directions. The hardest part?? Choosing which photos to use! !